Developer Metro Property Development will take Brisbane’s largest riverfront land release this year to market in a major auction event on August 8. Metro acquired the former Montrose Access riverfront site at Corinda earlier this year and has now commenced civil works on the 34 lots, including 10 riverfront lots overlooking Fig Tree Pocket. The civil construction work and all landscaping on the project - dubbed Riverside Corinda - is expected to be completed in July. The riverfront land will be sold as land only with the remaining 24 lots sold as house and land packages. Lots will range in size from 450sqm to 1005sqm. Metro has engaged a number of architecture firms to design a series of facades and plans and the homes will be built by Metro’s building company Creation Homes. Details on the 10 waterfront land lots will be launched in late June and sold via auction on August 8. The 24 house and land packages will be officially released to the market on July 4 with sold via EOI on August 8. The precinct is expected to generate total sales of more than $35 million. Ray White real estate agent Cameron Crouch, who is marketing the project, said more than 700 parties had registered interest in the land. 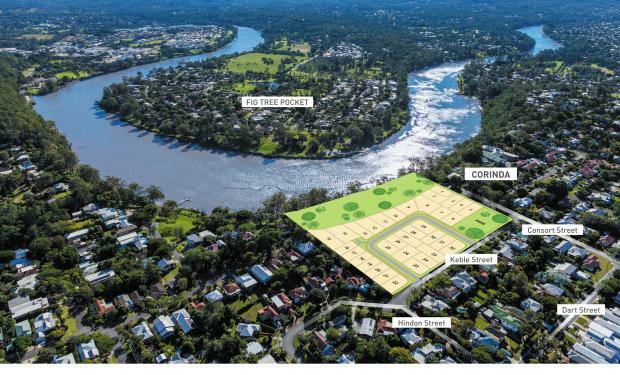 “It’s rare to see new land come onto the market in inner-Brisbane, especially flood-free land located so close to the Brisbane River,” Mr Crouch said. "The local market is the strongest that I have seen for many years, we have more and more buyers wanting brand new homes and vacant lots of land so that they can build their dream homes. Metro Property Development Managing Director Luke Hartman said the site was one of the premium infill sites in Brisbane and fit in with the company’s goals to diversify its extensive portfolio, which includes the apartment developments Newstead Central, Newstead Towers and Central Village in Fortitude Valley. The Corinda development is located on the corner of Consort and Keble Streets and delivers easy proximity to local services and public transport infrastructure. The development is less than 700 metres to Corinda Train station. Directly across the Brisbane River from Fig Tree Pocket, it will include landscaped parkland as a public access buffer between the new estate and the river.